Every once in a while I like to try out new side dishes, because let’s face it, grilled meat is a dietary no-brainer. With a nice piece of chicken, fish or lamb, sometimes just a sprinkling of salt and pepper and a nice hot pan is all you need. But it’s often the vegetable component of a meal that can end up making the nightly dinner seem lacklustre. I’m hoping to remedy that by sharing a few new things I’ve tried out lately, some flavoursome, exciting vegetable dishes that will brighten up the weekly repertoire. Let’s begin with this delightful dish from Sabrina Ghayour’s cookbook Persiana. I don’t buy cookbooks very often, but I couldn’t resist Sabrina’s, which has an array of recipes from some of my favourite cuisines and was incidentally, named the Best New Cookbook of 2014 by the Observer. There are two kinds of people in the kitchen; those who follow all the rules, and those who don’t. I think the difference between the two is confidence. I’ll admit, it takes years of effort to develop the confidence to break the rules, and to build faith in your own palate but if you don’t start somewhere, you will miss out on lots of fun and lots of good food, because nobody’s kitchen is perfectly stocked all the time. 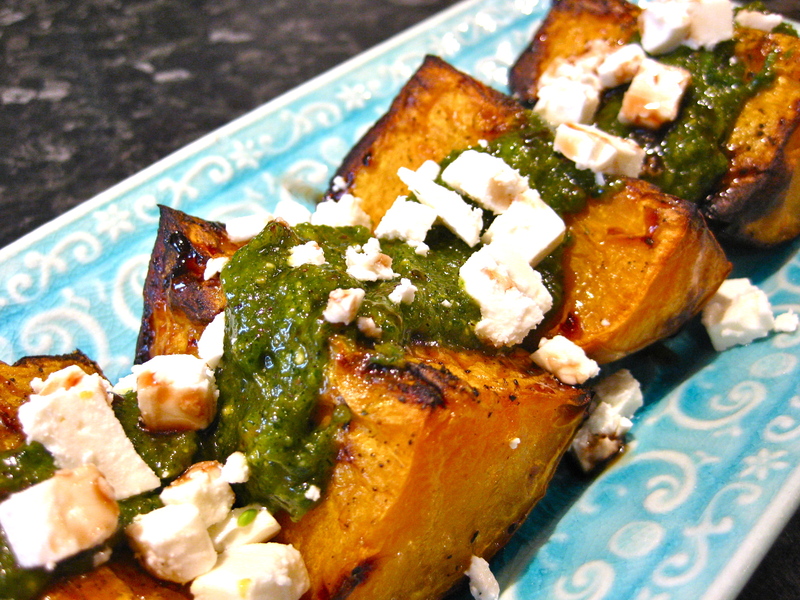 If you can’t or don’t want to make your own pesto, then in the very worst case you can use some from a jar, because with this dish it’s the combination of the sweet butternut, the nutty pesto, the tart feta and the astringent zing of the pomegranate that makes it work. This is a good recipe to start breaking the rules. I didn’t have any pomegranate on hand, but I did have some pomegranate syrup that I drizzled over at the end, and I didn’t have loads of parsley and used dried dill instead of fresh. I also had only a handful of pistachios so I had to reduce the recipe to only enough for one serving. But everything still worked out and it was a delicious accompaniment to our middle-eastern spiced chicken. Place the oiled and seasoned butternut squash skin-down on the baking tray and bake until it’s fully cooked and soft all the way through, about 45 minutes. To make the pesto, place all the ingredients, except the oil, in your food processor and blitz it a bit to get everything broken down. Then add the oil bit by bit to slacken the mixture to how you like it. To serve, place the butternut on a plate, and put generous dollops of pesto on each piece, and then crumble the feta over the top and finish off with the pomegranate.